This Multipurpose Flashlight Has Many Different Options To Meet A Diverse Range Of Needs. From The UV Light Which Is Used To Authenticate Original Currency And Documents, To The Different Light Functions Which You Easily Achieve With The Click Of A Button. No Harsh Pushing Or Pulling Needed, It's A Simple As The Click Of A Button. It Is Windproof, Rainproof And Designed With An Anticorrosion Layer To Withstand Any Harsh Environment. Equipped With An SOS Help Function, This Is A Must Have For All Campers, Hunters Etc. For The Handy Person In Your Life; This Do It All Flashlight Is Also Equipped With A light Option; As Well As A Magnetic Bottom For Those Hands Free Uses. At SAMLITE We Provide Ourselves In Creating High Quality Products To Make Your Life Easier. No Need To Have 5 Tools; When This Handy Pocket Flashlight Can Do It All! Great Gift For Kids; They Will Love Being Able Select The Different Color Options, And For The Man In Your Life To Service All His Lighting Needs Whether In The Field, Camping, Or Simply To Have At Home For Emergencies. We Guarantee This Product Is A Win. ► It has a glow in the dark push bottom to make it easy to turn on the flashlight in the dark. ► It Is Windproof, Rainproof And Designed With An Anticorrosion Layer. ► Its Weight is 4.8 oz. (excluding battery). ► Size: length: 4.50 ", height: 1.5 ", length: 1.5 ". SAMLITE dedicates to provide best to our all valued customers with excellent service. We pride ourselves by offering only the best in quality so please order with confidence. ► SUPREME QUALITY: Made of high quality aluminum alloy. This flashlight is sturdy and durable enough for long time daily use. ► MAGNETIZED BASE: The magnetic base makes it a Multipurpose Easy Hands Free flashlight. You can use it for hiking, camping or at home etc. 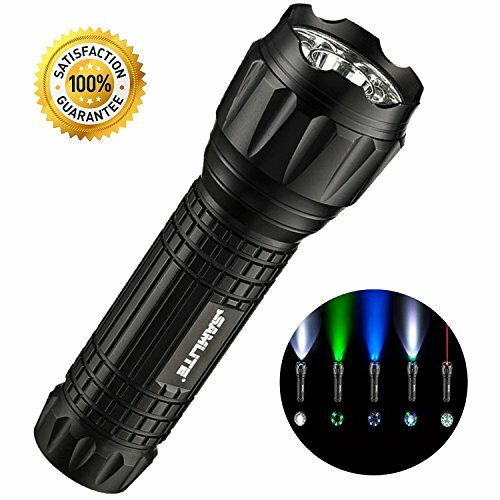 ► 5 MODES: Flashlight Is Equipped with 5 Different Lighting modes: LED Bright white light, Green light, UV Blacklight, Red Pointer Light, Green flash. ► BATTERIES INCLUDED: 3 AAA batteries and battery adapter included so you just have to pop in the batteries and start using by the minute the flashlight arrived to your door, no hassle on purchasing batteries separately. ► 100% MONEY BACK GUARANTEE!! If You Are Not Completely Satisfied with Our LED Tactical Flashlight within The First Year, SAMLITE Will Replace It with a New One or Refund Your Money Back, No Questions asked!! Our Customers Is Our Priority! If you have any questions about this product by SAMLITE, contact us by completing and submitting the form below. If you are looking for a specif part number, please include it with your message.